Chimpanzees are social animals that are usually found in small groups of about 40 to 60 individuals. Different species of chimpanzees display different types of behavior. Chimpanzees live in large social groups that have a definite hierarchy. The dominant male is referred to as the alpha male that dominates the entire group with respect to hunting and mating. Dominance is not just acquired by power, but also by manipulation and politics. This hierarchy is also noticed in female chimpanzees. One of the major occupations among chimpanzees in a group is grooming one another, which means cleaning another chimpanzee. In the evening, chimpanzees build their nests using a variety of materials. They share food with each other and even cooperate with each other in hunting other animals. Chimpanzees are intelligent and smarter than most other animals. They are smart enough to construct their own rudimentary tools and use them in different ways. They have sophisticated hunting skills. They have conscious about their status, and they can be manipulative and deceptive if they need to be. 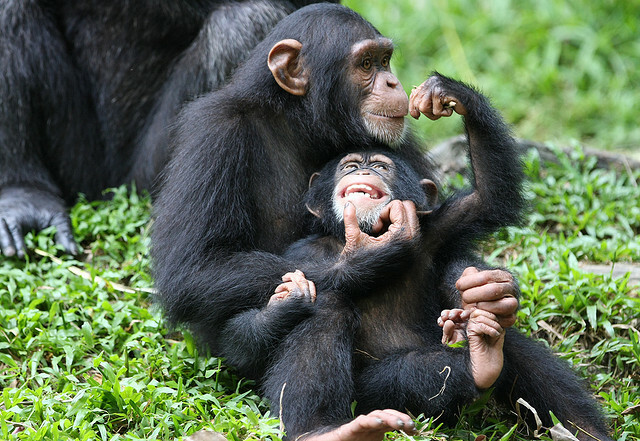 According to some studies, chimps can also display sign language symbols to communicate with other chimpanzees. They use hand gestures and facial signs and expressions for communication. Chimpanzees are highly territorial and mark their territory clearly. They become highly aggressive if others try to come close to their territory. Each of the species of chimpanzees has different behaviors. The most common species of chimpanzees – the pan troglodytes - are more vicious, aggressive, and dominating than the other species of chimpanzees. They are characterized by complex social relationships, and they usually live in tribes headed by the alpha male. Pan troglodytes, or common chimpanzees, are omnivorous and have been known to attack humans. On the other hand, the bonobo species of chimpanzee is non-violent, less aggressive, and mainly famous for its sexual receptiveness. They do not hunt or fight much.